It’s been a long time since my last round of Anime Movie Reviews, but now it’s back for more! Here’s a list of movies I’ve found the time to watch and score, and if you have any additional recommendations, let me know in the comments! With the way the original Fullmetal Alchemist ended, I admit that I was actually excited to see Conqueror of Shamballa. It had a huge opportunity to fix the unnecessarily bittersweet finale and tie up loose ends. Instead, it only added to the confusing ending and ended the series on an ultimately poor note. Not only that, but I didn’t like the way Al’s character was handled in the film and Rose’s real world counterpart was an annoying stick in the mud – I don’t even care to remember what her name is, that’s how awful of a character she is. The movie does very little to satisfy the fans, and in that way it makes for an even worse conclusion than the original Fullmetal Alchemist. Sacred Star of Milos was not a good movie. What bothers me the most is that it’s supposed to be an inclusion to Brotherhood’s storyline, which is unfortunate considering what a let-down it is. For one thing, the film’s animation style being a stark contrast from the quality of Brotherhood’s makes for a somewhat bitter viewing experience. The movement and action is jilted, the characters hardly resemble themselves, and the setting is dull. Combine the sporadic presentation of the film with a sloppily written story and boring characters and this movie is far from good. At this point, the only aspect of the movie that is getting any points from me is that I thought Julia’s character design was cool looking even if her personality didn’t match it. I saw previews for this on the Brotherhood DVD’s and was excited to look into watching a movie of the critically acclaimed anime. But after watching You Can (Not) Advance, I have no desire to look into the rest of the movies or the original anime. While the animation is crisp and colorful and the action scenes are done well, the rest of the movie doesn’t hold up. Shinji is quite possibly the worst character I have ever come across in an anime – his whiny, daddy complex overpowers his character to the point where he can’t contribute anything to the plot besides causing problems while drowning in an unrealistic amount of angst. The rest of the cast is bland and forgettable, making the movie boring to watch. The fan service and confusing ending is frustrating as well. Overall, I didn’t get a sense of the plight of humanity’s struggle to fight back against the clearly superior enemy the way I do in other series such as Attack on Titan. It was a mistake to watch the second installment rather than the first one, but I don’t think my thoughts on this series would have turned out any differently. My Neighbor Totoro is a cute film that explores the sweet bond between sisters with the signature fluid Ghibli animation. Totoro, the mascot of the company and the movie, is somewhat terrifying in his origin film. On one hand, he could be adorable and funny, but then there were those moments when he opened his mouth and suddenly became horrific. I was surprised that the sisters weren’t scared of him at really any point of the movie. Despite this minor gripe, the backgrounds were well-done and pretty to look at. Overall, the film is certainly entertaining, but not the best of the Studio Ghibli films I’ve seen. Rebellion is a beauty to watch. The animation is slick, crisp, bright, and some of the highest quality I’ve seen in an animated movie. Despite its presentation, the execution of the characters and story is not on the same level. Taking place after the show, the story in this movie casts aside everything bittersweet about the show’s finale in favor of character development for Homura that contradicts everything she stood for in the show. She goes from being the best character in the show to the worst one in the movie, which is never a good sign for such a popular character. For me, the canon of Rebellion ends with the elephant carriage, because everything else that follows is a mess and ruins the original show’s ending. An extremely depressing yet beautiful folktale adaptation, The Tale of Princess Kaguya’s stylized animation is elegant and fluid. However, I was disappointed by its ending and the emotionally riveting scenes that wound up only being dream-sequences. Despite this, the strength of this movie lies in Kaguya’s character growth. She is likable and realistic, and her plight to stay with her family was touching and sweet. The strongest aspect of the film lies in its art style and presentation of the culture and setting, ultimately saving the film for me. A wonderfully animated tale of siblings Seita and Setsuko trying to survive the ravages of war, Grave of the Fireflies is bittersweet and compelling. The story has a nice combination of comedy and tragedy, expertly weaving the two together to create a powerful narrative. The bond between Seita and Setsuko is one of the sweetest relationships I’ve ever seen in an anime, and it was easily the best part of the film. However, I find that there was no reason for the two to be forced to live in poor conditions and struggle to find food. Perhaps it’s a reflection of the culture at the time for the Aunt to promote Seita to be strong and independent, but that did not give her the right to cast out her own relatives. As a result, I thought that was the weakest and least convincing part of the movie. 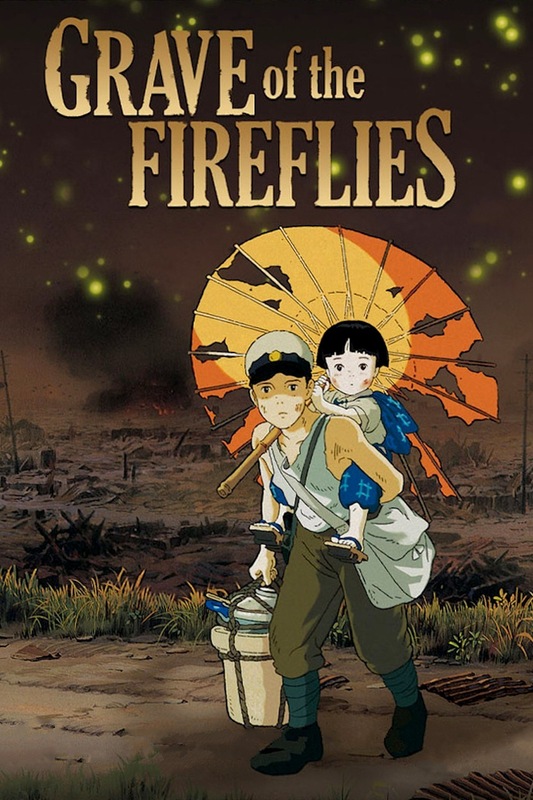 Despite that, the narrative and rest of the characters felt more realistic and well-done, and it’s through these points that Grave of the Fireflies shines. A story of unrequited love, Five Centimeters Per Second has an undesirable ending, but because of this it makes the movie a deceptively realistic reflection of real-life. The movie signifies the importance of letting go of the past and learning to move forward. By incorporating this message subtlety in the film, it makes the movie worthwhile. The animation is striking with its bright and insanely detailed backgrounds. The only issues I have with the film are that the characters aren’t very likable or interesting and Tono’s constant narration of the obvious is unnecessary and even irritating at times. If you have any movie recommendations or thoughts on the movies scored above, let me know in the comments! Yeah, the Full Metal movies didn’t live up to the series. At least they weren’t offensive and butchered the franchise like Rebellion did. That’s true. The original Fullmetal ending was already bittersweet and somewhat disappointing, so while Shamballa didn’t fix any of that, it also didn’t make it much worse. I was really disappointed by what Rebellion did to the original show though, namely Homura’s character and ruining the ending of the show. That was not okay.